A recent addition to the Dassault Systemes Dymola portfolio is the Suspensions library, developed by Claytex, built on the platform of the VeSyMA Library. This library focuses on the development of suspension systems primarily for the investigation of vehicle handling, including road, driver and stability control models. The VeSyMA library provides many templates and common components, allowing easy interfacing with and building of vehicle models and tests. The themes of the VeSyMA library have been continued throughout the Suspensions library, with ease of use and control being forefront in design consideration, with common templates and interfaces used to allow extension, development and investigation to be straight forward and intuitive. As each of the multibody models are built from common components, it allows both ideal and bushed models to be made using the same templates. With built up examples of both ideal and bushed versions of quarter car linkage included. 3 versions of the bushes, linear, non-linear and frequency dependent bushes can be swapped into common components such as links and control arm mounts. With each linkage there is the option to either use ideal joints or a selection of different bushes, which allow accurate modelling of suspension mountings to fully evaluate suspension movement and force distribution. To account for compliances in the suspensions other than the mounting method there are also a large set of compliances that can be added to the components, both ideal and quasi-static, allowing a linkage model to fully describe the motion and flexing of the suspension system. To ensure that model maintenance is kept to a minimum both the bushes and compliances are able to be added to any linkage model, meaning that all versions of the linkage are extended from the same template. In addition to the multibody linkages there are 2 sorts of linkages included, table based and aggregated double wishbone linkages. These two linkage types are designed to produce the same motion and force as the multibody models but be quicker to simulate to make real time simulation easier to attain for any linkage type. Given all suspension models share a common interface, any linkage can be built into half car suspension models with left and right sides sharing the same linkage model. Both bushed and non-bushed fully parameterised model examples exist of quarter, half and full car systems. 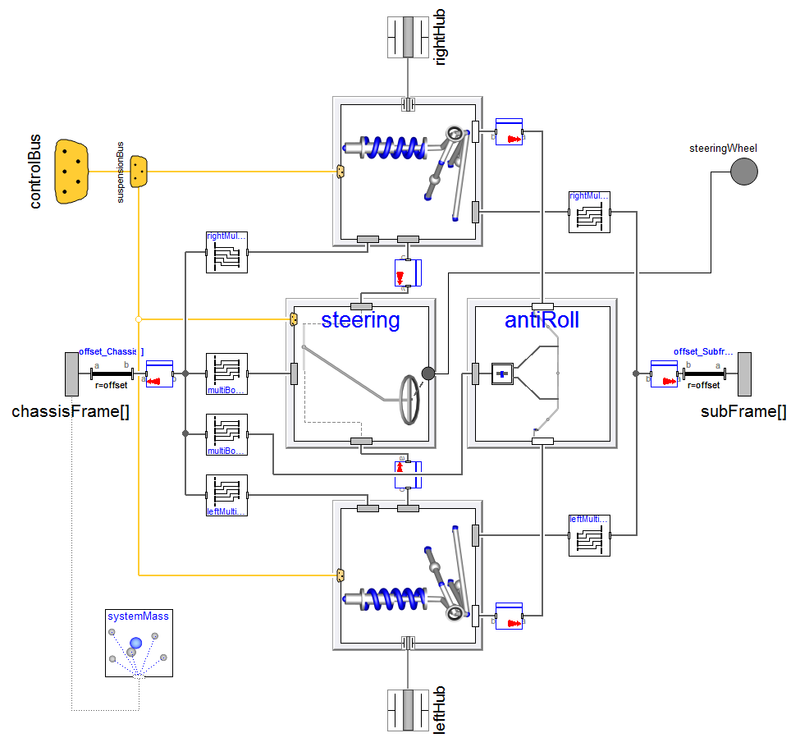 Several anti-roll and steering models are modelled also using the common interface method and half car template. Creating steered and non-steered half car models using the VeSyMA templates is easily done with the templates already supporting the use of flexible chassis, subframe and suspension models. There are several tyre models in the library; the Pacejka Magic Formula in both versions 6.2 and 5.2 are included in a full set of equations, broken down into several individual calculation blocks for easier understanding; F-Tyre integration with the option of multi-threading included. The layouts of the tyre models are extended from templates, allowing creation of additional tyre models. This makes integrating them with the rest of the library straight forward. 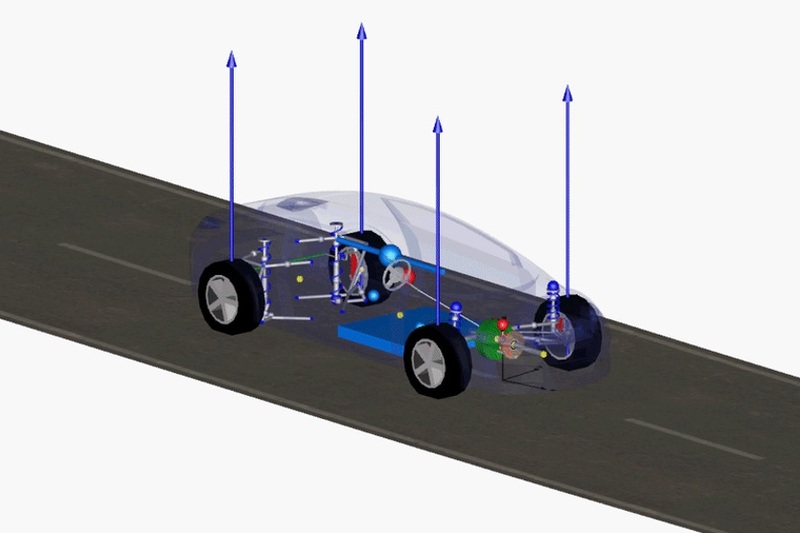 With the use of the common vehicle templates and ideal VeSyMA library powertrain models, vehicles can be created that can be used in a multitude of predefined vehicle tests. Users are also able to create new experiments using the road creation functions, vehicle rig models and developed driver models with open or closed loop longitudinal and lateral control and test driver models. With the various tyre models, bushed multibody suspension and various road models, the inclusion of surface roughness is also included in the road surface. Based on the ISO-8608 standard there are several grades of road surface allowing for applicable roughness for the test to be more applicable. Along with the higher frequency surface roughness there are curbs that can be built into models as shown below. Feel free to contact sales@claytex.com to get more information on the VeSyMA – Suspensions library.